45 years after the original movie hit theaters, Bleecker Street has released the first trailer for their remake of the 1973 classic Papillon. 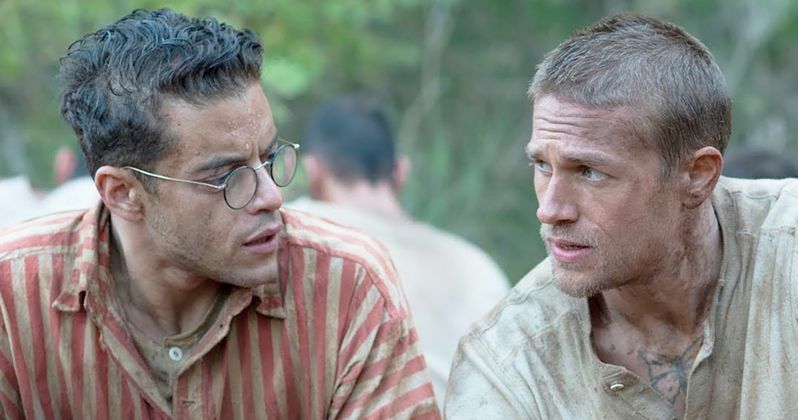 Charlie Hunnam and Rami Malek star as Henri "Papillon" Charriere and Louis Dega, respectively, roles that were originally played by Steve McQueen and Dustin Hoffman in this film based on an incredible true story. It will be interesting to see how fans react to this film, especially since there have been some who have questioned the validity of Henri "Papillon" Charriere's "true" story. The original autobiographical novel Papillon was first published in France in 1969, by Henri Charriere, recounting his harrowing experience of being incarcerated for a murder he didn't commit in French Guyana in a 14-year period between 1931 and 1945. The book was a huge hit in France, spending 21 straight weeks as the number one bestseller, before it was translated into English by Patrick O'Brian and published for English readers in 1970. Charriere, who was nicknamed Papillon, the French word for butterfly, because of a butterfly tattoo on his chest, always maintained that the story he told in the book was true, but there are some who have claimed otherwise. Charriere claimed all the way up into his death in 1973, the same year the original Papillon movie was released, that the story he wrote in his book was true, but the story's authenticity was challenged by a French journalist named Gerard de Villiers in his book Papillon Epingle (Butterfly Pinned), who claimed that roughly only 10% of Charriere's incredible story laid out in the book was actually true. Villiers claimed that there were a lot of similarities between Charriere's book and a 1938 book called Dry Guillotine by Rene Belbenoit, which recounts his incarceration and escape from a French penal colony on French Guyana. The Papillon publisher Robert Laffont admitted in an interview before his death that Charriere presented Papillon as a novel, but he suggested that it should be released as an autobiographical novel. Regardless of whether or not Papillon is a true story or not, the original film was considered by many to be a classic, with Franklin J. Schaffner (Patton, Planet of the Apes) directing from an adapted screenplay by Dalton Trumbo (Spartacus) and Lorenzo Semple Jr. (Three Days of the Condor, The Parallax View). The remake is directed by Michael Noer (R) from a script by Aaron Guzikowski (Prisoners), with a supporting cast that includes Tommy Flanagan Eve Hewson and Roland Moller. Bleecker Street has issued an August 24 release date for Papillon, which puts it up against Sony's Slender Man, Entertainment Studios' Repicas and STX Entertainment's A.X.L. in wide release. Papillon is expected to debut in limited release on August 24 although there is no indication of whether or not it will expand nationwide in the following weeks and months. It's possible that this could be a late summer hit that will draw in fans of the original film and fans of new stars Charlie Hunnam and Rami Malek. Take a look at the new trailer below, courtesy of Bleecker Street YouTube.